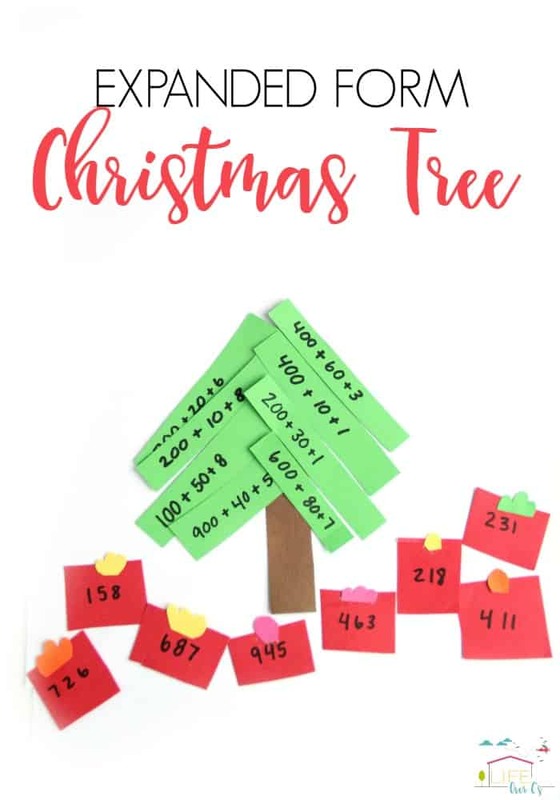 This expanded form math Christmas activity is a great way to address math concepts this time of year. Kids who are working on understanding three digit numbers and place value will benefit from breaking down numbers into their expanded form. Making a creative Christmas tree craft is part of the fun in this hands-on holiday activity! 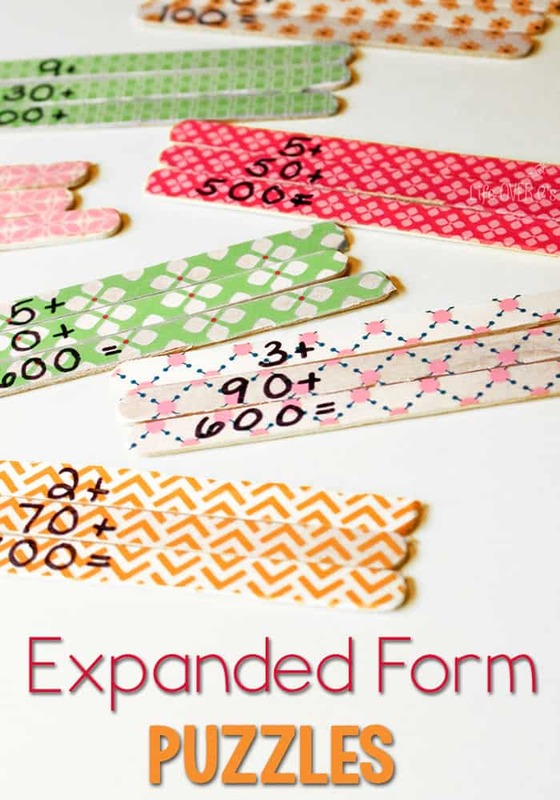 If you are looking for more ways to explore expanded form math, here are a few that you will love. To prepare this activity, cut the green paper into 1/4 inch by 4 inches. This would be a great activity for children who are working on scissor skills. 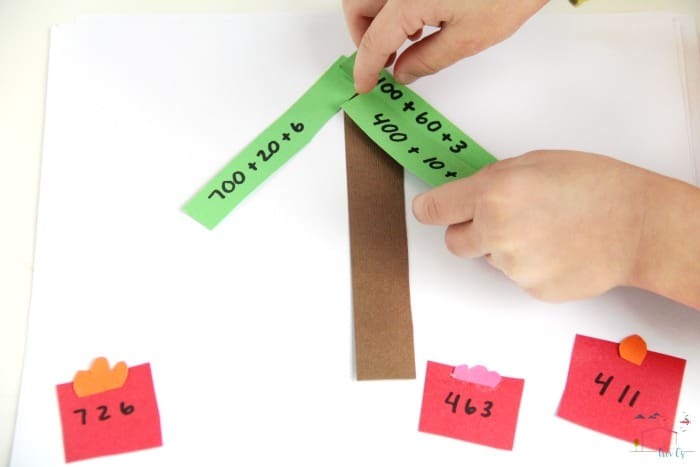 Cutting strips of paper is a beginner level scissor task and allows kids to practice accuracy and precision in graded cuts with the scissors. 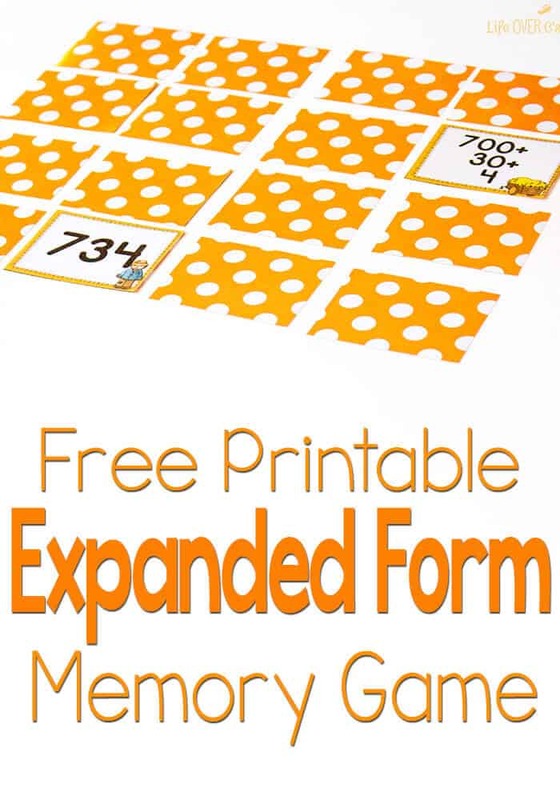 We did a similar math activity with this expanded form activity. Next, cut (or have the kids cut!) small squares from the red paper. Cut the brown paper into a long strip (about one inch by 6 inches long). Finally, cut small bow-like shapes from the colored paper. Glue these onto the tops of the squares. 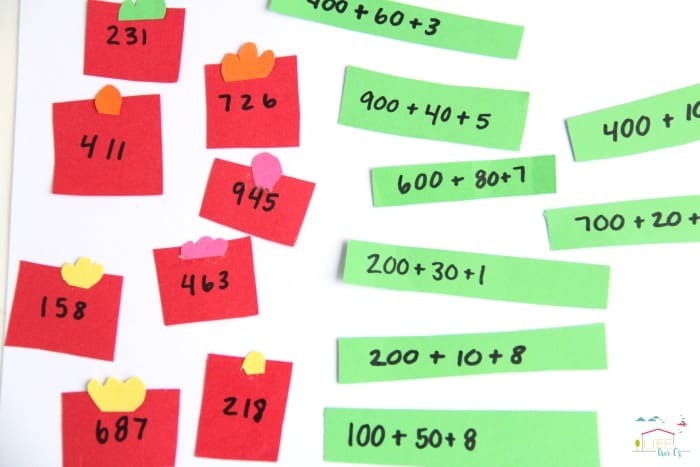 For each of these tasks, kids can be involved in the preparation. It’s a great direction following activity for little ones. Once the shapes are all cut out, you are ready to practice expanded form math with this Christmas activity. 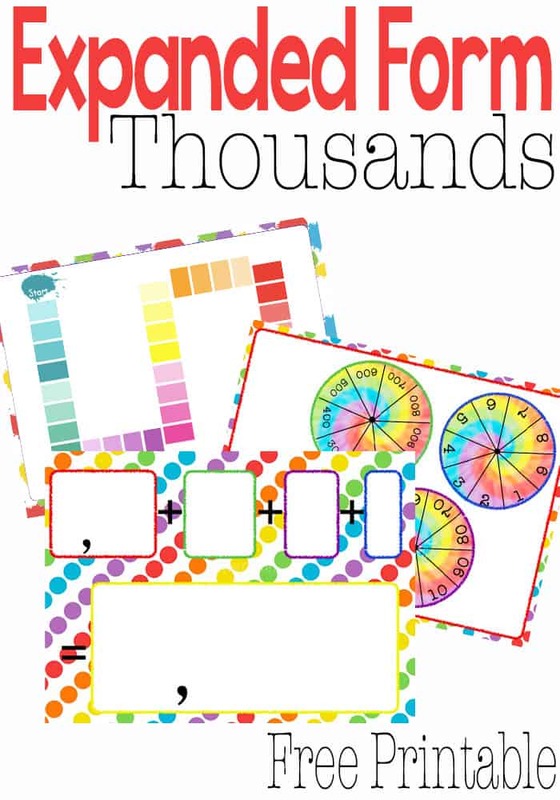 Ask your child to write down three digit numbers on the gifts. 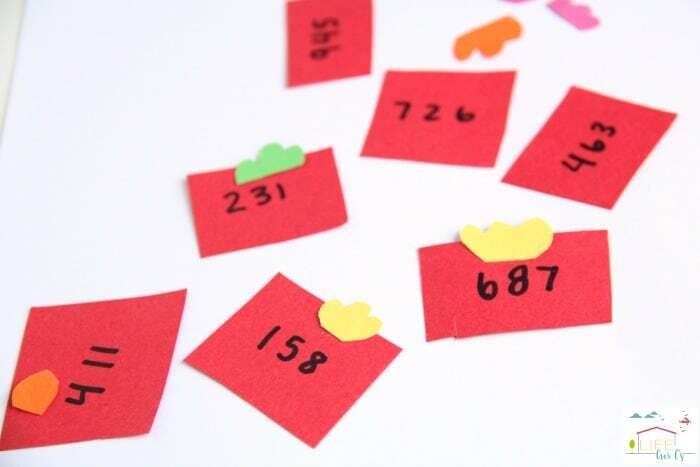 You can name numbers and ask them to write some or have them write out the number that you say in numerical form. 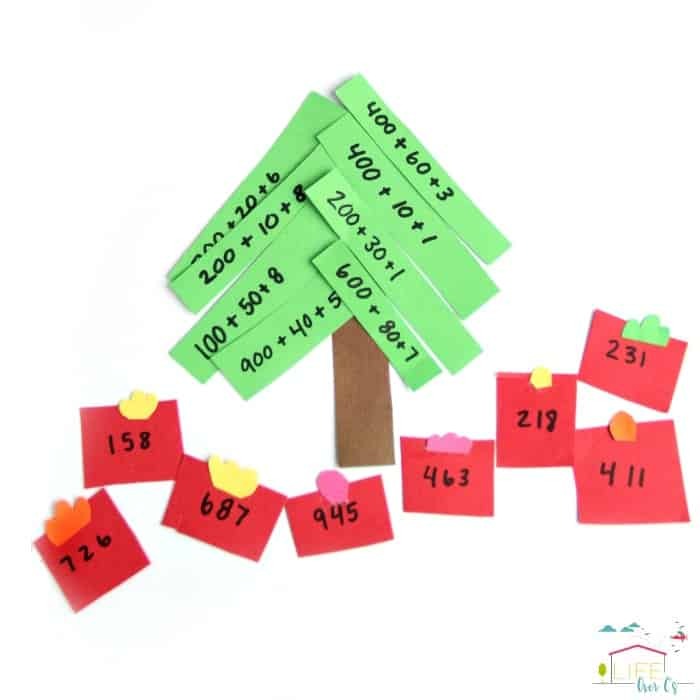 Next, ask your child to write out the numbers in expanded form on the green strips. At this point, start building the Christmas tree. Use glue to attach the trunk to a piece of paper. Ask your child to match up the green strip to each gift. They can glue the strips onto the Christmas tree, starting at the top. As they place each expanded form strip, have them glue the matching gift to the bottom of the page. You will have to show them how to stagger the top of the strip as they build the Christmas Tree. 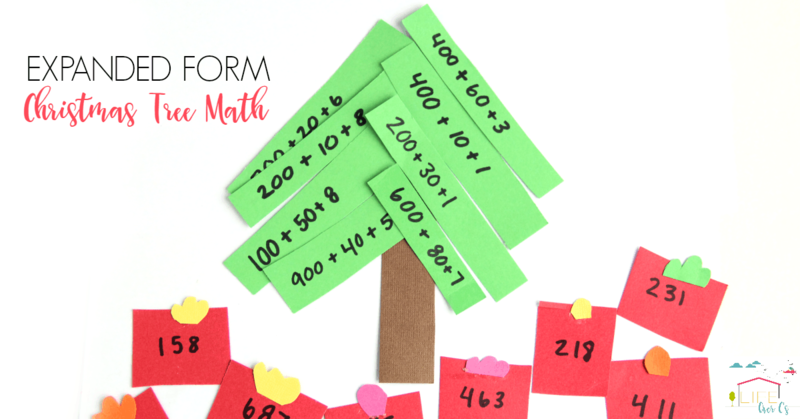 Have fun exploring and playing with hands-on math with this expanded form math Christmas activity!